The handsome, Buckeye 5300 Economy Slat Bed from Barn Furniture Mart has a classic, slatted design, in its lovely, curved headboard, and an easy 14-inch footboard that features clean lines. This Amish-made slat bed would make a wonderful addition to a child’s bedroom or a guest room, and is part of an entire line of bedroom furniture that includes dressers, nightstands, and armoires. This attractive, handmade bed is available in a range of woods and finishes, including cherry, oak, and maple (pictured in C. quartersawn white oak). The Buckeye 5300 Economy Slat Bed is the perfect companion to the Buckeye Economy Nightstand, the Buckeye Economy Chest of Drawers, or any of the matching pieces in the line. 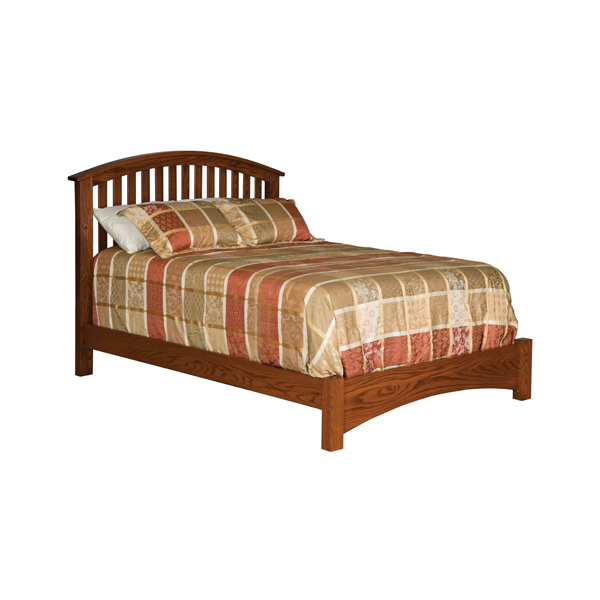 Like all of our solid wood furniture products, this slat bed is made in the USA, is designed to be stain and water resistant, and comes with a satisfaction guarantee.